Newton Mail, a multi-platform email app that’s been available on Mac, iOS, and Android, is finally reaching the last major platform it had yet to be offered on: Windows 10. Aside from, you know, being offered on Windows, there’s not much else new in the announcement. Newton Mail for Windows offers most of the enhanced features as it does on other platforms, including read receipts and additional sender profile features, while others, like the ability to automatically organize your emails will be coming soon. It’s compatible with the same slew of email providers, too: Gmail, Exchange, Yahoo Mail, Outlook, iCloud, Google Apps, Office 365, and IMAP accounts will all work with Newton. The biggest caveat, though, is cost. Newton Mail may have grown out of the free CloudMagic app, but it costs $50 per year to use. That price is for all platforms, though, so if you’re already a Newton subscriber, you’ll be able to simply install the Windows app and go about your day on your PC with all your existing accounts. But despite the advanced features and cross-platform functionality, you really have to consider if the cost is worth it for your inbox. 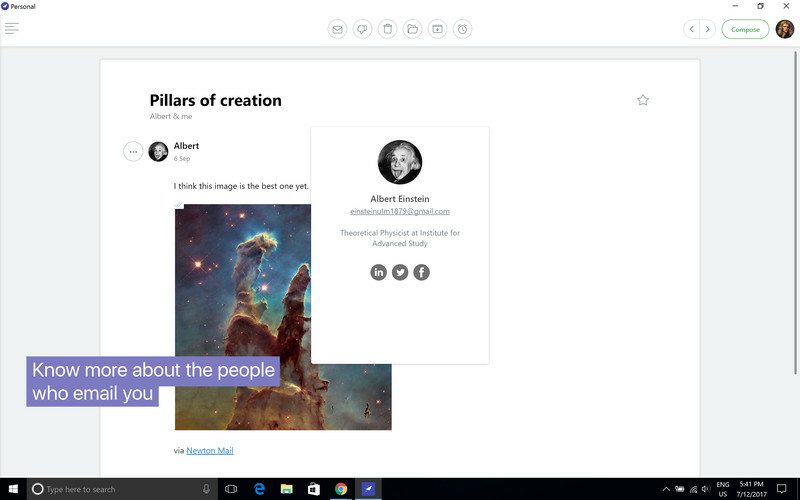 Correction: Some Newton Mail features, like Tidy Inbox, aren’t available on Windows yet, but will be coming soon.